Last week, I welcomed a lovely group filled with both returning & new students. These ladies were in for a night of extravaganza; it was "Casa De Crème" night! They came hungry for an equally exciting and delicious evening enjoying Chips & Roja Salsa, Mexican Haystacks, Creamy Verde Chicken Enchiladas, & Fried Ice Cream. ... And here's the lineup! Beautiful greens of roasted peppers and tomatillos, only fresh and delicious produce for this amazing white enchilada sauce! Time to get my students's hands dirty, and teach them the perfect way to wrap your enchiladas! Their technique was phenomenal. Into the oven, she goes! We all huddled together to move on to the next recipe- mexican haystacks! 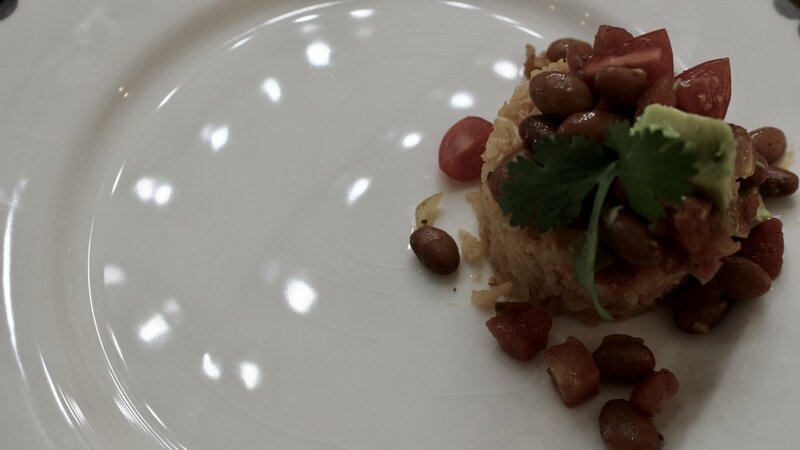 The authentic rice and beans join together harmoniously in one of my favorite side dishes ever! Drizzle with honey and dig in with a spoon! Beautiful presentation and so good, you'll want more! It was such a pleasure teaching another group of wonderful women (and another wonderful menu!) on a cool and cozy night. I always enjoy meeting new students and greeting the old ones. Thank you for the wonderful memories made on another tasty evening!